Tough Sheds - Who Has The Best Tough Sheds for Sale? Tough sheds can be the perfect purchase for a keen gardener, or simply somebody who wants a high quality garden building that will stand up to the wear and tear of everyday usage for year after year. They may cost a little more initially, but thanks to their durability they can be a very wise purchase in the long term. There are lots of garden sheds that claim to be tough, however, so how do you know which one will be just right for you? Don’t worry, WhatShed are here to help with our handy guide to the 20 best tough sheds that can be purchased online in the UK right now. The first question we had to ask ourselves was: ‘just what is a tough shed?’ Metal and plastic sheds are naturally durable and low maintenance but they’re often lightweight as well, so all but one of the buildings in our list are made of wood. We’ve discounted any sheds that had solid sheet material, rather than tongue and groove or shiplap, and we’ve also looked for sheds that have frames that are thicker than the standard 28 x 28mm that we usually see. Tough glazing and long warranty periods are also factors that can help a shed climb the league table, as well as overall value for money, and for the purposes of this league table we’ve also discounted log cabins and workshops that have a base area of more than ten feet by ten feet. With so many high quality tough sheds on the market, narrowing it down to the twenty best was no easy task, but we’ve found sheds in all sizes and for all budgets. Against very stiff opposition, it’s congratulations to the Shed-Plus Champion Heavy Duty Combination Shed. It takes top spot in our list of the very best tough sheds that can be purchased online in the UK right now thanks to its innovative design with a secure storage area, dual access points, and long warranty period thanks to an initial pressure treatment. Whether you’re looking for tough sheds, or a plastic greenhouse, WhatShed bring you the independent reviews that can help you find the garden building that’s just right for you. Tough sheds can gain flexibility through their strength and durability; because they’re so tough and reliable they can be used for everything from storage purposes to a craft workshop, and there’s no shed that epitomises this versatile nature more than this combination shed from Shed-Plus. In effect it’s two buildings in one, with a very strong and reliable shed taking up most of the ten foot by eight foot floor space, and a secure storage area at the back. This area has no windows and is fully lockable, being accessed via its own personnel door. 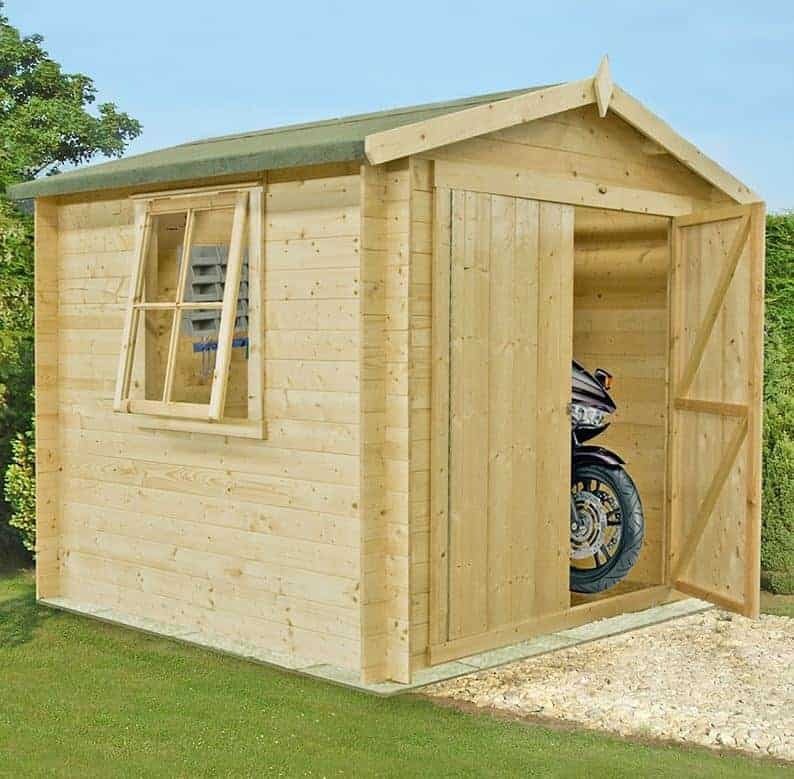 It’s this value adding feature, alongside what is one of the biggest and most attractively designed tough sheds on our list, that takes it to the very top spot. We were pleased to find that high quality tongue and groove cladding is used throughout this building, and that it’s supported by a slightly thicker than average frame size of 34 x 34mm. This is what qualifies this as one of our tough sheds, especially as further protection is given to the timbers thanks to an initial pressure treatment. It’s the reason that this shed is covered by a 15 year warranty period, adding further value. 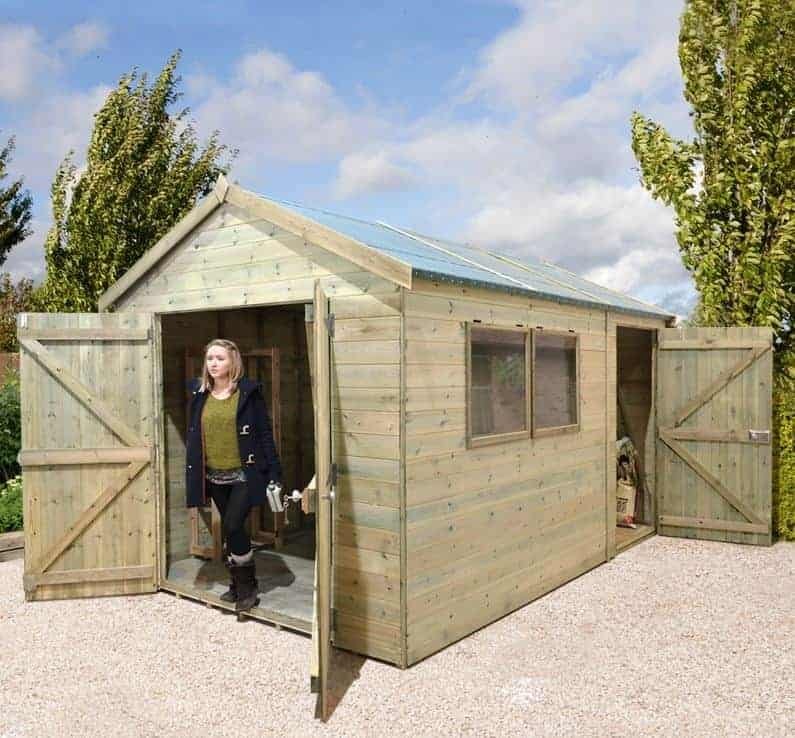 It’s not the cheapest shed in our guide, but it is made to the highest standard, so if your budget stretches over a thousand pounds this could be an ideal purchase. 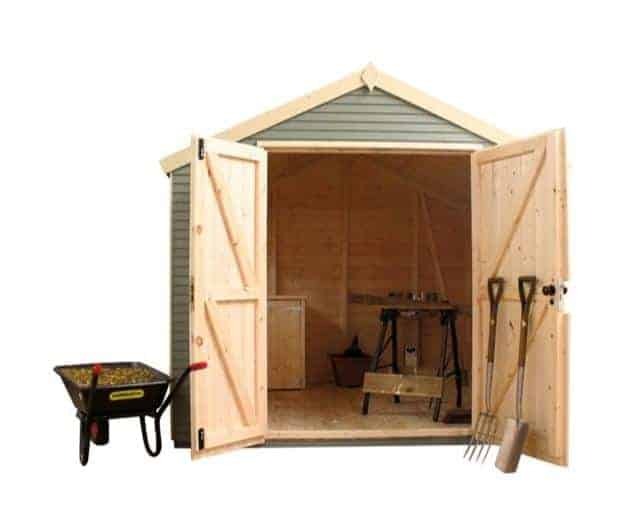 In second place in our league table of the very best tough sheds that can be found online in the UK today is another heavy duty shed from Shed-Plus which shows what a reliable and high quality manufacturer they are. This differs greatly from the combination shed, however, firstly in size. It has a base area of 2.42 x 1.82m, but this is more than enough room for storage purposes for most medium to small gardens, and there’s even enough room to move around in thanks to the apex roof which has a ridge height of 2.21m. It has a single door at the front, and we were glad to see that it features an integral key operated lock as this isn’t always something that we find on the tough sheds we review. The door is fully braced too to give it extra strength, and indeed extra strength is a feature that runs throughout this shed thanks to the thicker than average framing and tongue and groove walls, roof and floor. Once again a pressure treatment has been used, so that means the owner gets the added peace of mind that rot will be kept away for at least 15 years. 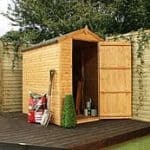 What takes this shed to second place, however, is the excellent value for money that it offers for such a well built and durable garden building. 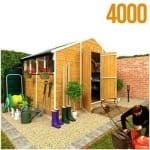 This is an ideal buy for people who are looking for tough sheds that won’t adversely affect their carbon footprint. That’s because all of the timber used in this good looking reverse apex shed have been taken from sustainable sources, making this one of the greenest sheds on the list. 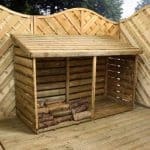 As a mark of this quality, the UK charity The Woodland Trust have put their name to this shed, and 5% of proceeds from each sale goes to the charity who plant new trees and manage and protect our existing woodland. It isn’t just its eco credentials that make this one of our favourite tough sheds however. Sustainable matchboard tongue and groove cladding has been used across all areas, and this is especially evident in the 16mm flooring which is significantly thicker and tougher than we usually see on ten foot by eight foot sheds such as this. 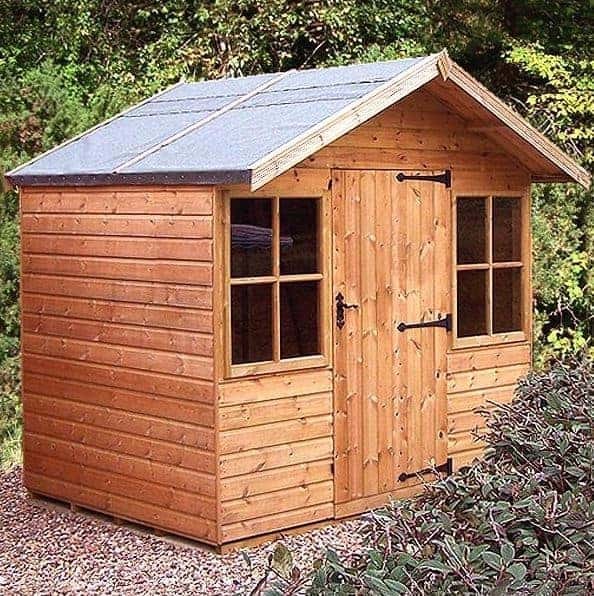 At 56 x 56mm the framing too is unusually thick, so this is an ideal shed for locations that are often prone to heavy winds and stormy conditions, especially as it also comes with the protection of a 10 year guarantee against the appearance of wet rot. We were also pleased to see that it comes with a key operated rimlock, so that it’s not just tough, it’s secure as well. 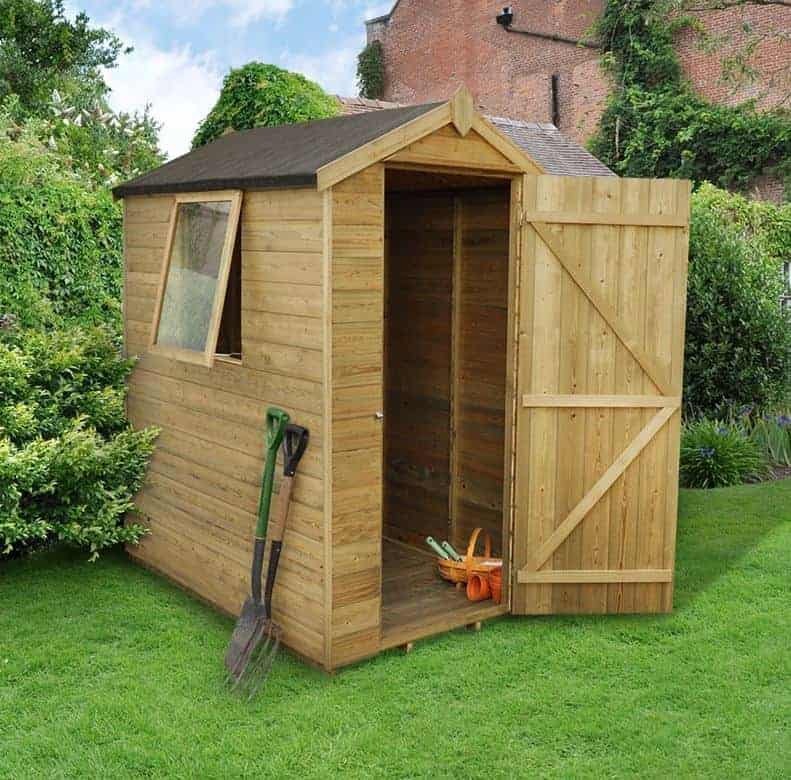 This is one of the smallest of the tough sheds in our WhatShed league table, but that in itself makes it a great choice for those who have a compact garden where lawn space is at a premium. It also means that it’s quick and easy to install, even for those who’ve never assembled a garden building before. What gains this a place in the upper section of our league table, however, is the excellent value for money that it offers. 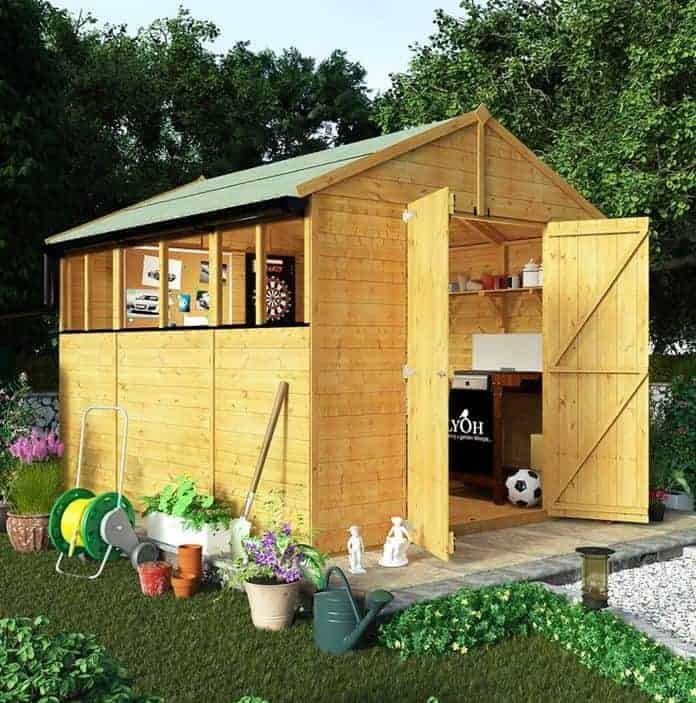 For less than three hundred and fifty pounds it’s now possible to have a shed that’s both tough and functional. Depsite its 1.78 x 1.14 base area there’s still a good amount of storage space inside, thanks to the apex roof that reaches up to a height of 2.05m. It’s also light and airy inside the shed, thanks to the window that we were pleased to see could be opened for ventilation purposes. We were also pleased to see that the tongue and groove cladding had been pressure treated and given a 15 year guarantee, and the frame size of 45 x 28mmm was far in excess of what we would have expected for such a compact and low cost garden building. If you’re looking for tough sheds that are affordable even on small budgets, then this is one for the shortlist. We now go from one of the smallest to one of the largest tough sheds in our league table, with this one offering a base area of 3.02 x 2.44m. Despite this, it may be ideally suited to shallow gardens, and that’s because it has a smart reverse apex design that means it’s significantly wider than it is deep. At one end of the front panel are double doors, which are wide opening and thus make it easy to move items of almost any size and shape in and out. Next to these are two windows, which can be opened to allow fresh air in whenever required. This is especially important if the shed is to be used as a workshop, which we can easily see happening thanks to the generous dimensions. Even more impressively, the windows have toughened glass, which is ideal if you’re likely to have small children playing near the shed. Toughness is a byword of this shed, as shown not only by the choice of glazing, but by the fully braced doors, and by the heavy duty 34 x 34mm framing that’s allied to the tongue and groove cladding. As it’s been pressure treated by the manufacturer, this cladding is also supplied with a 15 year guarantee, which isn’t always the case with the tough sheds we review. This is one of the most unique and original tough sheds that we’ve reviewed, and we were struck by its appearance at first sight. It takes the traditional pitch of a curved roof and transforms it into a curve. This makes it very pleasing on the eye, and it’s even more effective at channeling rainwater and snow away. This duty is further helped by the tightly interlocking tongue and groove cladding, meaning that there are no gaps for water to get through and therefore the contents of the shed are kept safely dry. What most impressed us about the cladding however was its thickness, with a 12mm thickness on the roof, and 16mm used for the walls and the floor. This is much thicker than we usually see, and a low price tag as well makes this one of the best value tough sheds we’ve seen. 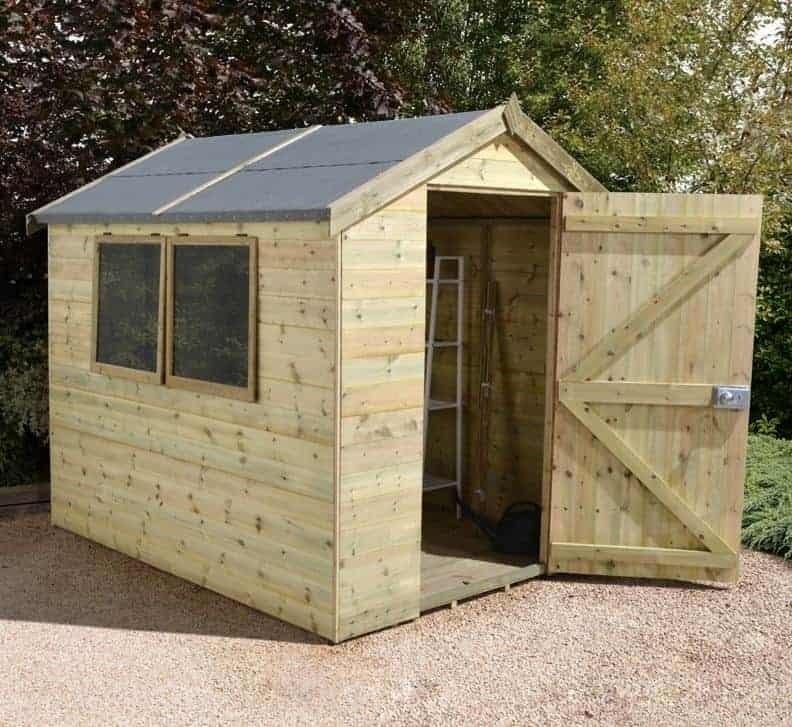 For such a strong six foot by eight foot shed, with original good looks as well, the price of less than five hundred pounds is more than reasonable. 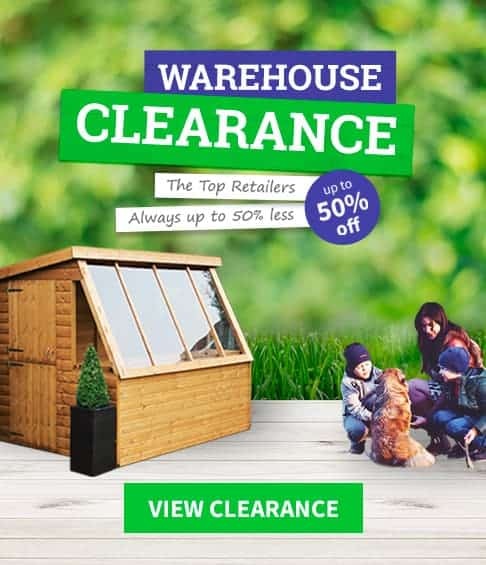 Added to this is the fact that 5% of the proceeds from each sale go to the Woodland Trust charity, making this an ideal purchase for greener consumers in search of tough sheds at an affordable price. This is first of the pent roofed tough sheds to earn a place in our league table, not counting the curved roof variation above. Whilst this means that it doesn’t have the vertical space offered by many of the apex roofed sheds we review, the peak height of 2.03m should still be enough to prevent consumers feeling cramped or claustrophobic when inside. One advantage that a pent roof brings, is that they are a more subtle and less obtrusive garden building, whilst still having the classic appeal of a traditional design. This means that they can more easily be hidden away behind a wall or fence if desire to give them added security. We were pleased to see that a stainless steel lock was provided as well, as even the sight of an obviously tough lock such as this can be enough to deter some opportune thieves from attempting to break in. High quality tongue and groove cladding has been used throughout, and then pressure treated to give it a long lasting protection as exemplified by its 15 year guarantee. We were also glad to see that the framing had been planed all round, giving it added strength and durability, which isn’t something that we always find on tough sheds at such an affordable price. 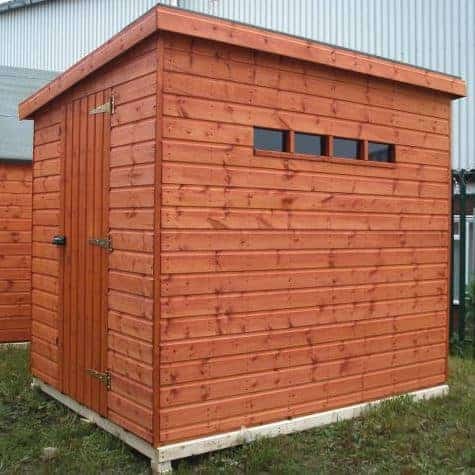 All but one of the tough sheds in our league table are made of timber, with this one exception. It’s made of plastic, and whilst all plastic can be said to be tough in that it’s resilient and not prone to damage from rot or rust, plastic sheds can sometimes seem a little thin and therefore vulnerable to the elements. That certainly wasn’t the case with this Lifetime shed, which is why it full earns its position in the upper half of our top 20. What makes this shed so tough is that it’s made not of PVC but of high-density polyethylene. It’s a very strong and durable material, especially as its panel thickness of 20mm is greater than we usually find on the plastic garden sheds we review. 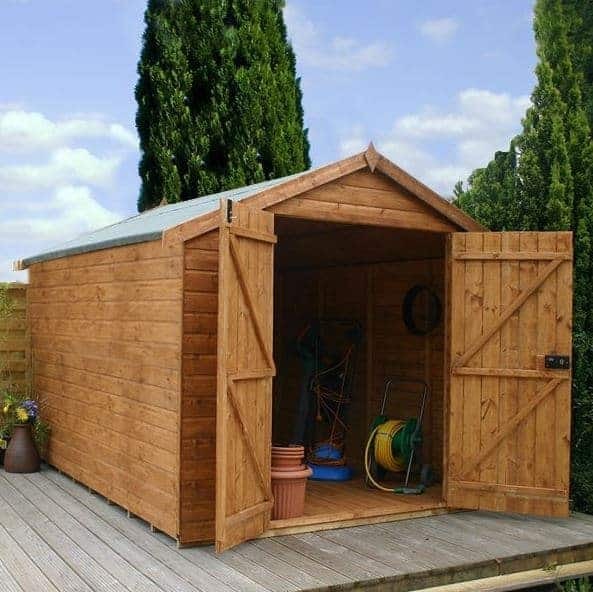 It’s also UV resistant, so you won’t have to worry about the colour fading as can happen with some older plastic sheds. The other thing that distinguishes this from other plastic sheds is its appearance. It has strikingly original looks, with curved tops to the double doors and a shingle pattern on the grey roof that contrasts with the off white walls. We know that plastic tough sheds aren’t to everyone’s tastes, but we found this to be as attractive as it is strong, and the price is very reasonable too. This could easily be perceived as a log cabin, so thick is the 19mm cladding used for the walls, but with tongue and groove used in preference to loglap and a base area less than ten feet by ten feet this qualifies for our league table of the 20 best tough sheds. It more than earns its place as well, because it’s very strong and dependable. As well as the thickness of the cladding itself, we were pleased to see that chalet connections had been used for the corners. This gives it a high level of protection against the wind, and its added stability in difficult conditions makes it a great choice for gardens that are situated in exposed areas. The 2.70 x 2.70 base area makes this one of the most spacious tough sheds in this league table, and so we were pleased to see double hinged doors included which means that it’s easy to move furniture or machinery out. For that reason, we can easily imagine this being used for a generously sized garden storage area, a summer house to relax in as you look out of the one opening window, or even as a workshop for a home run business. It’s only the lack of a pressure treatment, and the provision of a 10 rather than 15 year warrant, which stops this from being placed even higher. Tough sheds bring obvious advantages in terms of longevity and durability, but their toughness can also be a positive security feature as well, meaning that it is much harder for criminals to gain access by breaking in. 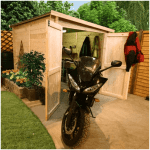 If security is one of your prime concerns when it comes to garden sheds, then this model could provide the perfect solution. That’s because it features no windows at all. The window free design means that there’s no way that passers by can tell if anything valuable is being stored inside, which makes it less likely that a thief will break in on the off chance that it may be worth their while. A key operated lock supplied with the double doors also adds to the overall security, and it’s something that we always like to see in the tough sheds we review. This is a shed that not only looks tough and uncompromising, it acts tough. From the heavy duty mineral felt that covers the taller than average apex roof, to the thicker than usual 27 x 45mm frame, this is a tongue and groove shed that’s been built to last. We were pleased see that the framing had been planed and rounded as well, as this adds extra strength and stability as well as demonstrating a welcome attention to detail from the manufacturer. If you like tough sheds that have a design and personality all of their own, then this could be exactly what you’ve been looking for. Taking a step away from the traditional British shed designs, this follows the style of Dutch barns that have long been popular on the continent, and we found it very eye catching. The first thing that caught our eye was the roof, which is five sided. It’s not only very good when it comes to channeling precipitation away, it also creates a lot of headroom inside the building. 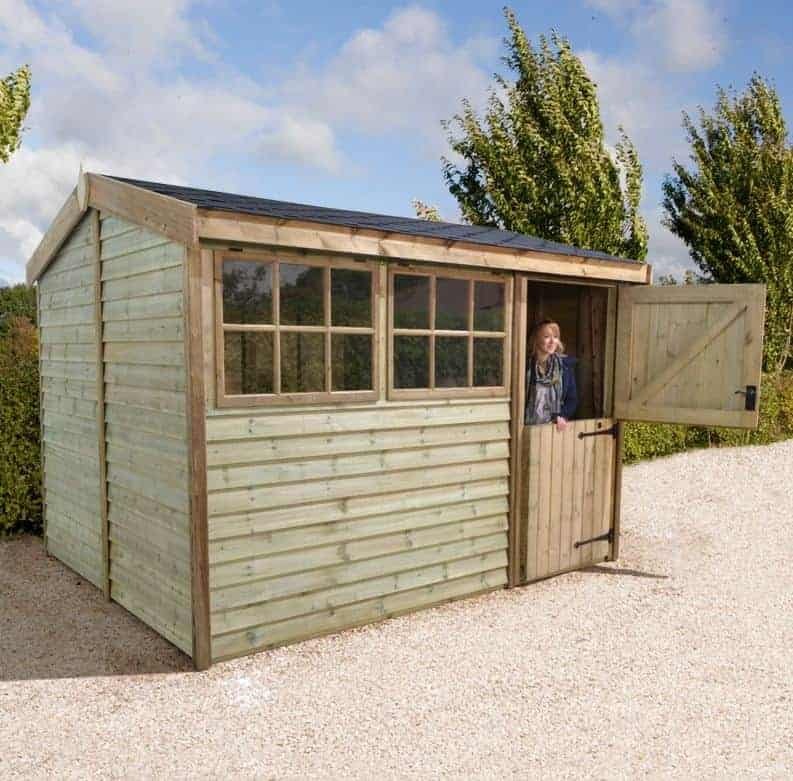 With a ridge height of 2.62m, this is the tallest of all the tough sheds we’ve reviewed and therefore ideal for those who want to store tall or long items. A garden building as large as this one needs a strong frame to support it, and so we were pleased to find a strong and reliable 27 x 45mm frame. We were also pleased to find that tongue and groove cladding is used throughout, which helps to give it such a pleasing appearance. A key operated lock for the double doors gives added value as well, so even though we would have preferred to see a 15 rather than 10 year warranty provided against rot, we still feel that this represents good value for money when compared to similarly sized tough sheds that have less attractive appearances. We’ve reviewed lots of tough sheds from the Champion Heavy Duty range, and they always live up to their title by being very hard wearing and durable. We were pleased to find, when we reviewed this model, that these qualities applied to their pent sheds as well as their apex sheds. 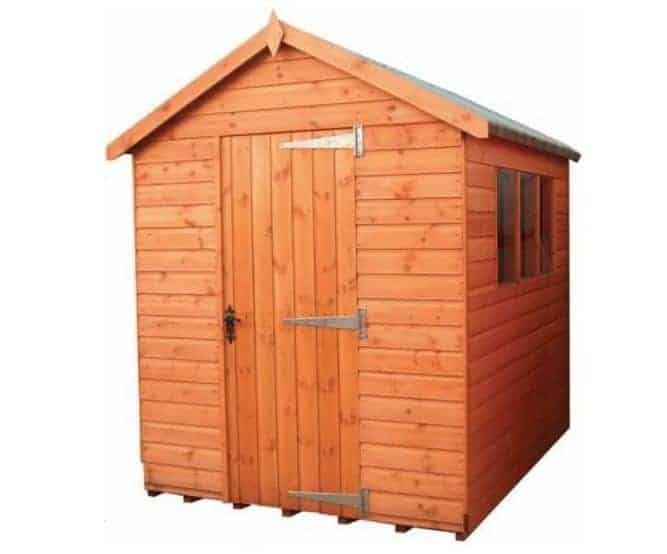 It’s not the most attractive shed we’ve reviewed, which accounts for its position in the lower half of our league table, but it is strong, reliable, and at less than six hundred pounds for a seven foot by five foot wooden shed we also think it represents good value for money. One thing we particularly liked about these tough sheds is that the single door can be bought either in a right or left sided position, meaning that the customer can get one that’s tailored to the design of their own garden. We also liked the provision of a15 year manufacturer’s guarantee, which shows just how effective the initial pressure treatment applied to the tongue and groove cladding and integrated floor bearers is. A 34 x 34mm frame gives added strength and stability, and in combination with its relatively compact design means that the building will feel very strong and rigid once it has been installed. The Ultimate range of tough sheds from Mercia have a lot to live up to. Whilst their league position shows that they fall slightly short of reaching the very top this is down to the higher than average price tag and 10 year, instead of 15 year, warranty period, rather than any shortcomings with the shed itself. This is one of the toughest sheds that we’ve reviewed, with 16mm tongue and groove cladding being used throughout rather than the 12mm that we usually see. This underlying toughness also extended to the two windows, which featured wired glass for extra strength and resistance to accidental impacts. 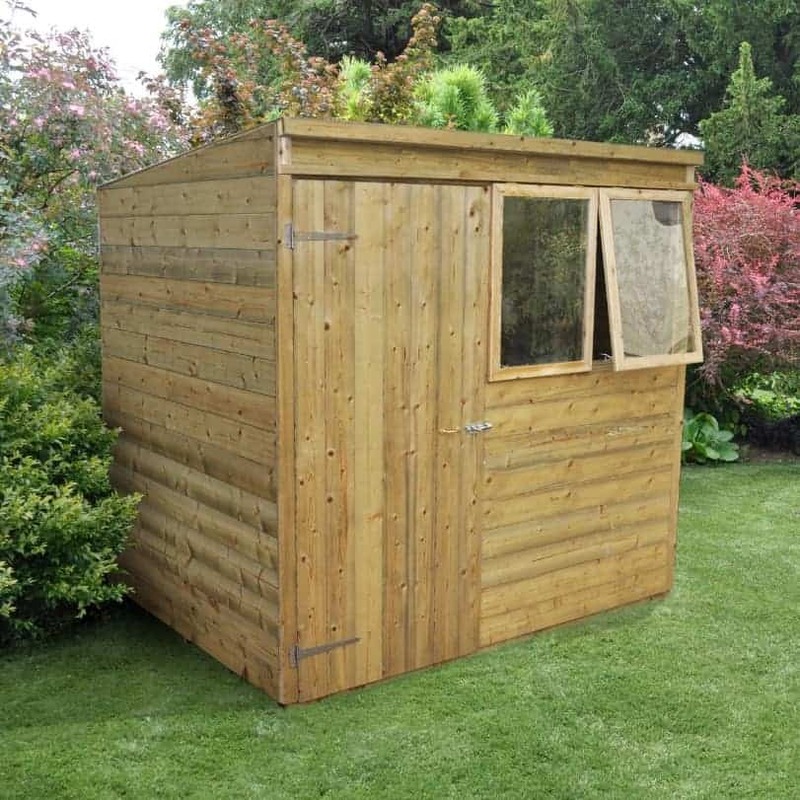 As well as a base area of 2.40 x 2.40m, which should provide a more than adequate amount of storage space for most small to medium gardens, this also has a tall ridge height of 2.30m. This makes it a very comfortable and spacious environment to walk around in, or to sit and work in, and as the windows can both be opened it shouldn’t feel too hot inside even on a summer day. If you don’t mind the rather high asking price, then we feel that these good looking and classically styled tough sheds have a lot going for them. Once again we have a garden building that claims to be the ultimate in tough sheds, and once again it’s only the relatively high price tag that prevents it from gaining a much higher position within our top twenty league table. 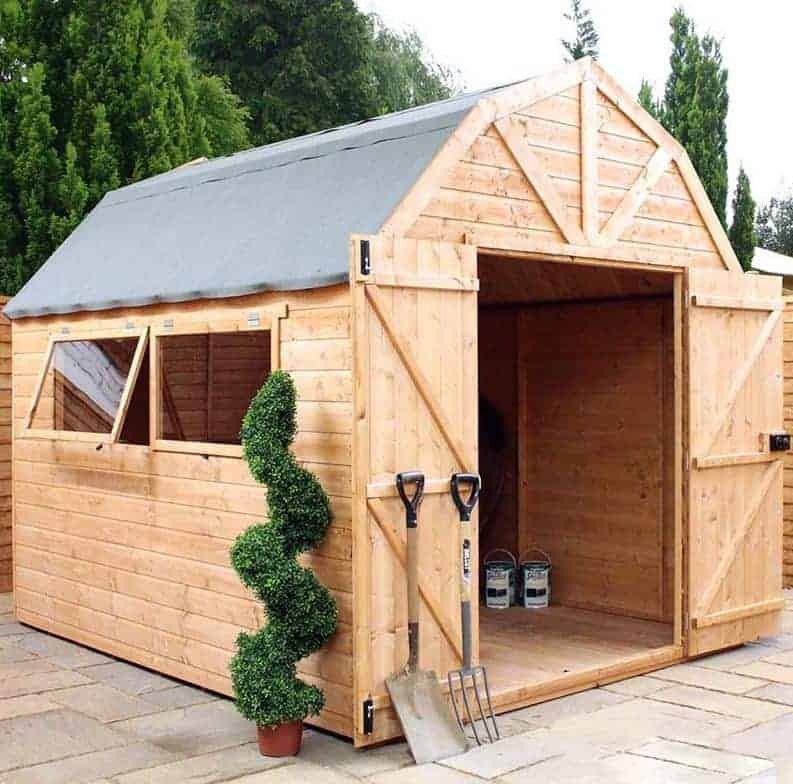 In fact this is the most expensive of all the sheds that earn a place in this list, but it’s also one of the most eye catching, and one of the toughest and most durable. If you have a budget that will cover the asking price of more than seventeen hundred pounds then this deserves to be one of the first tough sheds that you consider. From first sight we found this shed very pleasing on the eye. One reason for this was the very large cottage style window, which we were pleased to find included virtually shatter proof toughened glass. The other unique design feature that we liked is the stable style door which can also be used for ventilation purposes as well as making it easy to load and unload items from the interior. Very high quality 16mm feather edge cladding has been used for the walls, so the shed not only looks great it feels strong as well, and we were also pleased to see that these attractive yet tough sheds come with a 15 year guarantee thanks to their initial pressure treatment. 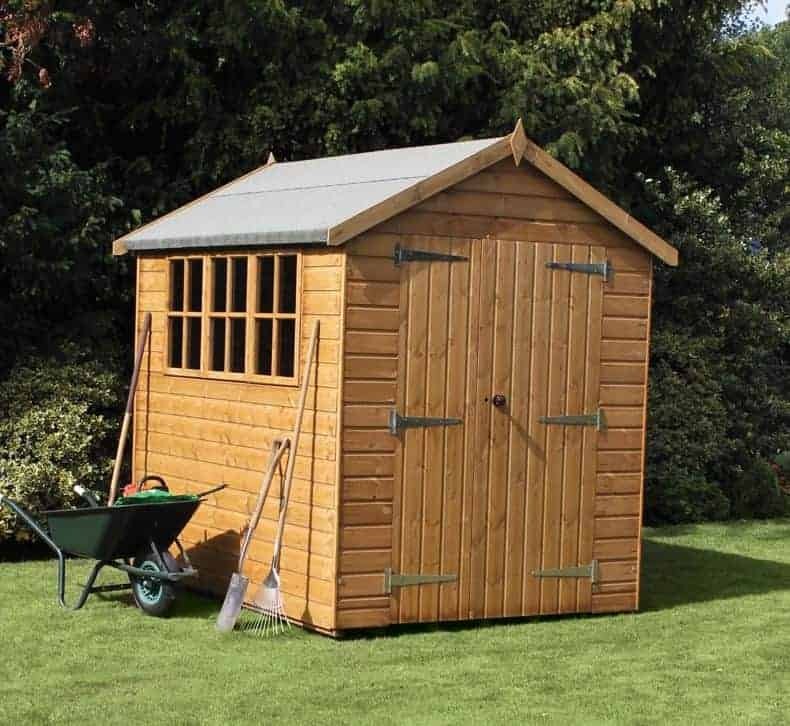 We’ve reviewed BillyOh sheds in many shapes and sizes, but this is their premium model that’s stronger and more durable than their other garden buildings. It’s also one of the most attractive tough sheds that we’ve seen, and with a very reasonable asking price attached as well, this earns a place in our top 20 league table. One of the things that we liked most about this shed was the bank of six fixed windows which run the full length of one side. This creates one of the brightest interiors that we’ve seen on a sunny day, which makes it an ideal environment to work in or to pursue a hobby in. This is also the tallest wooden shed that BillyOh manufacture, with a ridge height at the top of the apex roof of 2.35m. This complements the base width of 2.52m and depth of 2.95m making this one of the most spacious sheds in our league table. On the downside, however, this is the only one of our tough sheds not to come with a floor as standard, but even with the extra cost to add one we still feel that the overall price is good compared to most of the similarly sized sheds that we’ve seen. 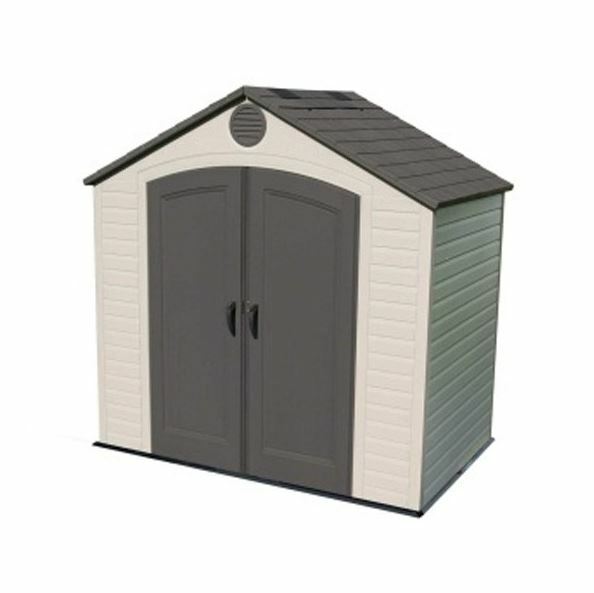 In many respects this follows the classic design that we and many others love when it comes to tough sheds, in that it has a rectangular base, strong and weather repelling tongue and groove cladding, and an apex roof at its summit. The thing that stood out when we first saw it however was the bank of three windows on the side panel. They have Georgian style cross hatching which we found a very nice touch that really catches the eye, and we were pleased to find that one of the windows could be opened as well. Of course, the traditional design of this ten foot by eight foot garden shed is not only attractive, it’s also very functional. Rainwater is quickly carried away, so the interior remains dry at all times. With this in mind, we would have liked to have seen an extended warranty provided rather than the one year statutory warranty which is provided on this occasion. It’s this that accounts for this model being placed in the final quarter of our 20 best tough sheds, but with key operated lock and a heavy duty 44 x 44mm frame as standard, this should still prove to be a secure and durable shed as long as the re-treatment schedule is adhered to. Even the name of these tough sheds, Rhino, installs a sense of confidence in the strength and durability of their products, and we’re pleased to say that we weren’t disappointed when we took a closer look at this eight foot by ten foot model. In fact this has the thickest frame of any of the sheds that feature in this top twenty league table, with dimensions of 70 x 44mm. This is also the dimension of the roof truss supporting the apex roof, so this should feel reassuringly strong and secure once it has been assembled. We were impressed by the high quality tongue and groove cladding used across all surfaces, and even more impressed that the standard 12mm could be upgraded by the customer if so desired, although this does bring with it an increased asking price. 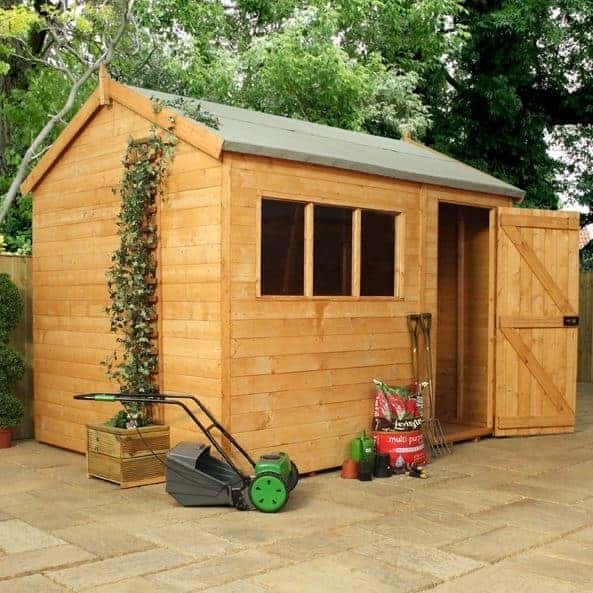 It’s the rather expensive price tag and the lack of an extended warranty that stop this shed from being placed much higher up the league table of tough sheds, but if wood preserver is added on an annual basis by the owner then it should still prove to be a very durable garden building. 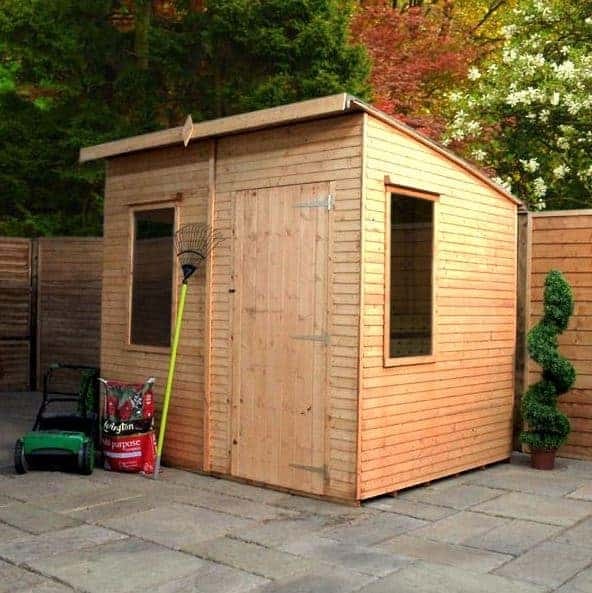 If strength and stability are your number one concerns when buying a garden shed then this should be added to your shortlist. This seven foot by five foot apex shed from Malvern may be one of the smallest in our league table of the very best tough sheds, but we were pleased to find that this didn’t mean that it was any less tough or durable. Tongue and groove cladding has been used throughout, and we were impressed by the use of 48 x 48mm framing. This combination, especially when applied to a building with a relatively compact footprint, creates a very strong and rigid structure that should be able to withstand heavy winds. We were also impressed by the four joinery made windows that run along the side of the building, especially as two of them can be opened to let a supply of fresh air in whenever needed, and that they are made of toughened glass. With this wealth of glazing potentially allowing passers by to see what’s being kept inside, security becomes even more important. That’s why we were pleased to find that a key operated mortice lock is included as standard, which isn’t something that we always see on tough sheds of this size. 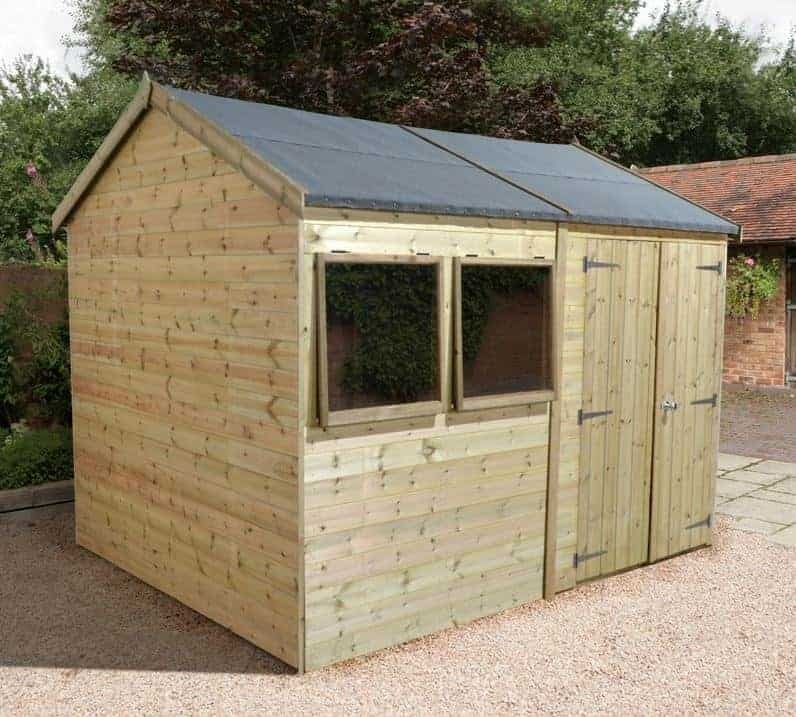 If you’re wanting a small to medium sized shed this has a lot to recommend it, but we would have liked to see a long warranty included, especially with an asking price in excess of a thousand pounds. We’ve all heard stories about thefts from sheds being on the rise, which is why shed security is becoming increasingly important to many people. One solution to this is to have a completely window free design, as we saw with the Groundsman shed which took tenth place in our league table. This, however, necessitates the installation of an artificial light source, but this TGB shed has an alternative solution. It has a row of windows that allow natural light to reach the interior, but they are very tiny and placed high on the front of this pent roofed shed. This makes it very difficult for any unauthorised person to see inside, which can be a real boost to the security of the building. We would have liked to see a padlock or key operated locking system included as standard with a shed built for security purposes, but these will have to be added separately. 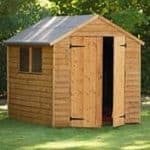 It’s also not the cheapest of the six foot by four foot tough sheds we’ve reviewed, and it comes without the reassurance of an extended warranty. These factors have led to its position near the foot of our table, but it does have a clever and useful design and the 22mm thick shiplap cladding puts it among the strongest of all the compact sheds we’ve reviewed. 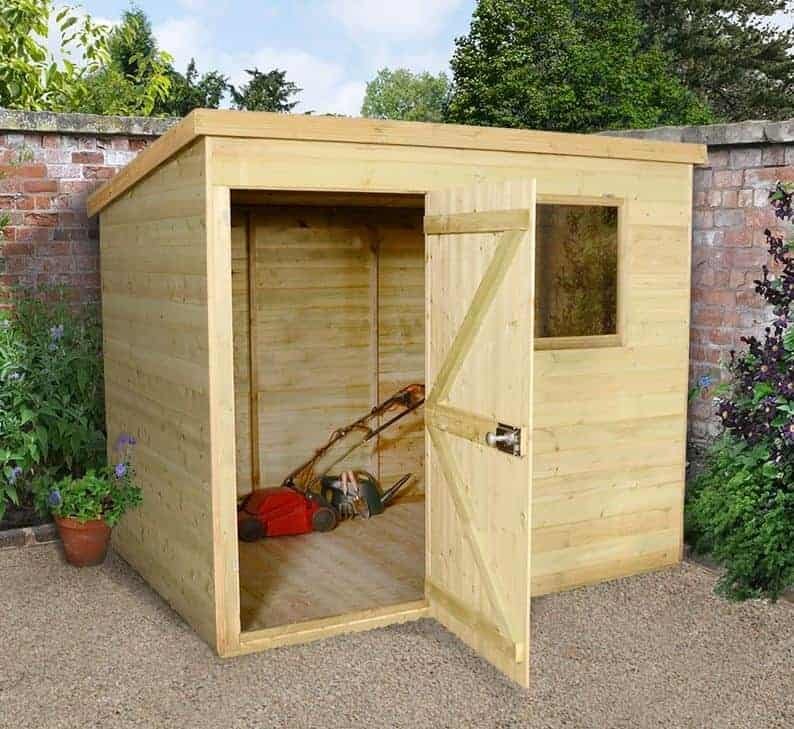 This model takes the final spot in our league table of the 20 best tough sheds that can be bought online in the UK today, but it’s still a very high quality shed in its own right. It also has a look all of its own, thanks to the overhanging apex roof which acts almost like a canopy at the front by creating a shaded area on a sunny day. We also liked the two square windows made from toughened glass on either side of the single hinged door, which again is unlike most of the tough sheds that we’ve reviewed, and yet we found it very aesthetically pleasing. This is also one of the tallest mid sized wooden sheds that we’ve seen, with a ridge height of 2.44m, the equivalent of eight feet, and an eaves height of 1.85m. We were also impressed by the 44 x 44mm framing underneath the tongue and groove shiplap cladding, and these are the features that have earned this Ludlow building a place in our league table of the very best tough sheds. The reason that it finds itself in twentieth place, however, is the price tag which is significantly higher than we see on most other eight foot by eight foot sheds, particularly as it doesn’t come with an extended warranty against rot. My two month old 10’x8′ Malvern Collection Ultimate Apex shed sits on a raised concrete base in a very sheltered position. It is so wet inside that I’m going to have to move all the garden equipment- mowers, shredder etc out as they will deteriorate if left any longer. Two items of furniture are already beyond repair. The last shed I bought was bone dry inside at all times for several years as was the thirty year old shed I used to own. I have no idea why this new shed is so poor but the only use I can think of for it is firewood.